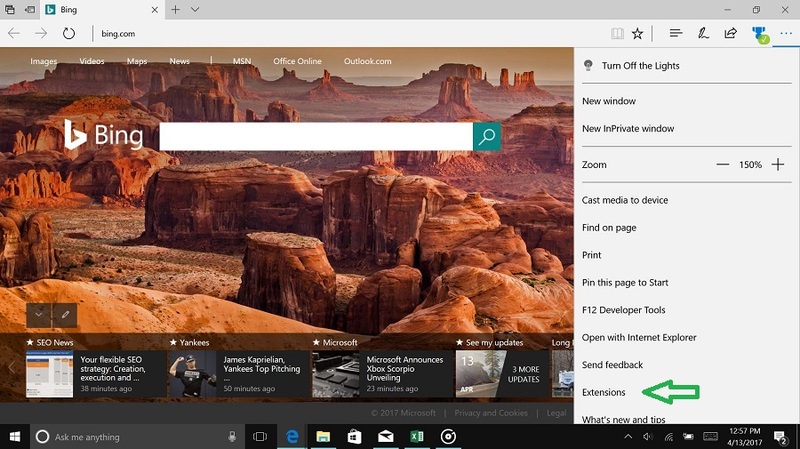 Microsoft Edge is a new browser that can be found on Windows 10 computers. Launched on July 29th, 2015, Edge has seen a pretty low uptick in usage by users. When launched, the browser did not have any extensions and was lacking some other key functions that rivals like Chrome, Safari, Firefox, and others had. 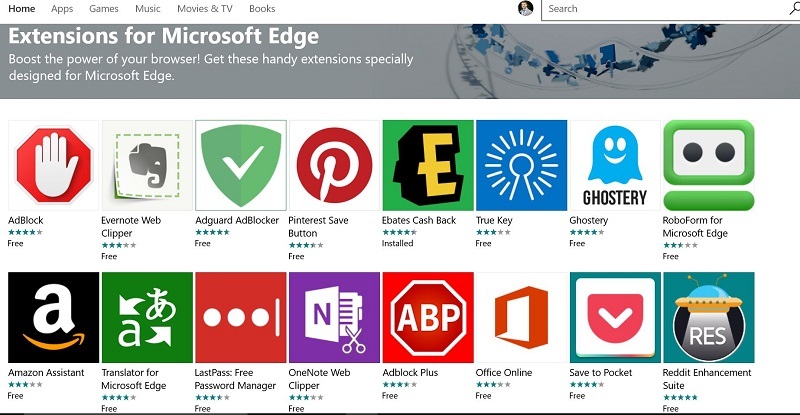 With many updates since 2015, Microsoft Edge has some features like extensions and plugins that can help you stay productive while you browse the web. 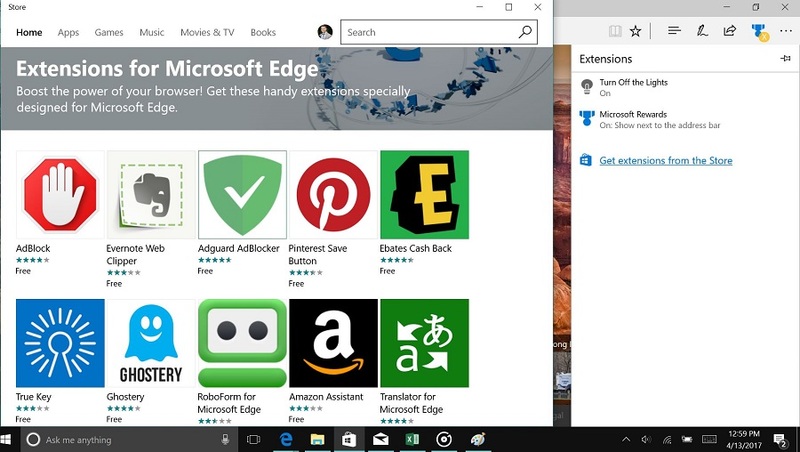 Here is the ultimate guide to finding, downloading, and using Microsoft Edge with extensions. If you are unfamiliar with where to find this browser, you should see a blue letter “e” at the bottom of your browser. You can click on that to launch the browser. If you do not see that, click on the search bar “Cortana” and search for Edge. Assuming you got Edge open, you will see three small dots at the top right which acts as the settings key. Click on that and you will see extensions at the bottom. Click on that and you will be brought to the Get extensions from the Store link that will launch the Windows Store and bring you to the extensions platform. This store gets updated pretty often, so you should check out the store to see what else is new from time to time. For this example, I am going to download the Ebates Cash Back extension. This extension can help me find coupons from over 2,000 online realtors. To download this, you click on the plugin that you want and click on the Get button. Once everything is downloaded, you will get a message at the bottom right of your screen letting you know it has downloaded. With Ebates downloaded as an example for this guide, you will see this extension now ready to be turned on in your browser. You will see a picture like this below. With Ebates downloaded, you can pin it to the top of your browser so you can see the deals when you are on sites. To pin it, you need to click on the three dots at the top right and right-click on the extension. Click on Show next to address bar to pin it to the top. Here is an example of the Ebates extension working on the Clarks website. With the extension running in Microsoft Edge, I see the logo light up n red with a message letting me know about 8% cash back. This basically works because Clarks has opted into Ebates as an affiliate partner. Since this has already been set up, Ebates will then show the deal that is associated to the Clarks account since we are on the website. There are other extensions that are available to download in the store. At the moment there are 25, but this list keeps updating as more become available to download. Here is a short breakdown of some of the bigger extensions and what each one does. Amazon Assistant –> Works by how the names sounds. When you go to the Amazon website, you will see things like the deal of the day, order notifications, product comparisons, and much more. Office Online –> Allows you to edit, view, and create files in your browser. Gives you direct access to your office files whether they are on your computer, or saved in OneDrive. Page Analyzer –> Shows common errors, opportunities, and optimizations to apply best coding practices. Turn Off the Lights –. Makes the entire page fade into dark which is perfect for watching YouTube videos. The browser will turn more into a cinema experience. Microsoft Rewards Extension –> Gives you quick access to view your earned points and the daily points left on any page you want. If you want to learn more about this, you can check out the Microsoft Rewards guide. Ghostery –> If you are looking for more privacy on the web, you might want to check out this. Ghostery detects and blocks tracking codes that websites use to re target you. By doing this, you can improve the speed of sites as it does not have to call for the cookie based drop. uBlock Orgin –> An alternative to Ad Block. This extension uses less PU and memory compared to some of the other providers. Save to Pocket –> While you surf the web, you can save article and videos to view at another time. LastPass –> Saves your passwords for a wide range of sites including Dropbox, Google, Outlook. Trello, MailChimp, and more! Removing these plugins is very simple. Click on the three dots at the top right of the browser and head over to the extensions tab. From there, you can scroll down to the extension you want to remove and right-click on it. You will see the option that says to uninstall it. You can also hover over the extension and click on the wheel to uninstall it as well. More and more developers and dedicating their time in creating more experiences for users who use this browser. 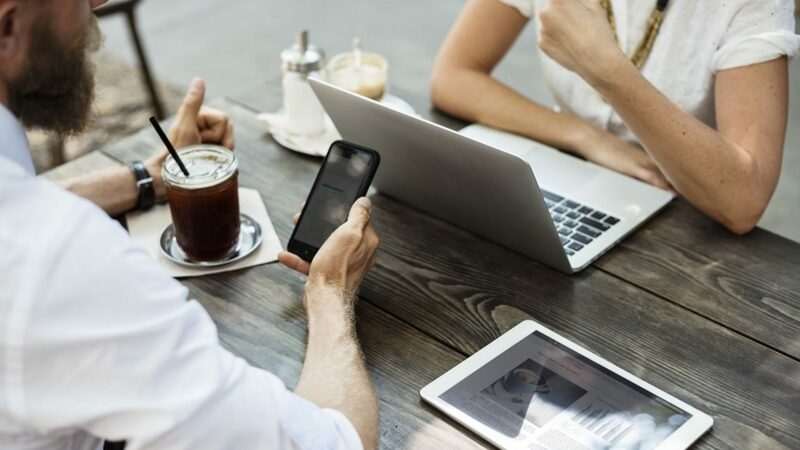 As this browser gains more market share, you can expect even more developers jumping on to create experiences for their core audiences. Another thing to remember is that the more people who use this browser, the more updates will happen which will allow these plugins to get better and better. In the United States, this browser has a market share of around 6% as of April 2017 on desktop. While small, it has grown each month since the launch of the platform back in 2015. At this time, you can only find Edge on a Windows Phone which is pretty disappointing if you have an Android or iPhone. I am hoping / expecting that this browser becomes part of the mobile strategy so things that you save on your desktop will carry over to the mobile experience. Let me know if you have any extensions that you like in the comments below!